After shooting a short documentary for Reuben Hollebon (pictured below) in the summer of 2016, Other Brother studios were asked by his record label, Bright Antenna Records, to make an official music video for his song 'On & On'. Other Brother Studios went to work finding a Director who we thought could bring an epic and meaningful interpretation to the production. James Slater was the perfect fit for the brief, which was loosely based on a robot themed short story that Reuben himself had written many years ago. Not only is James an acclaimed music video director, having made videos for artists such as Kaiser Chiefs, Daughter, Major Lazer to name but a few as well as winning an NME award last year for his 'Zombie' video for Jamie T, but he also had the perfect vision for the video. 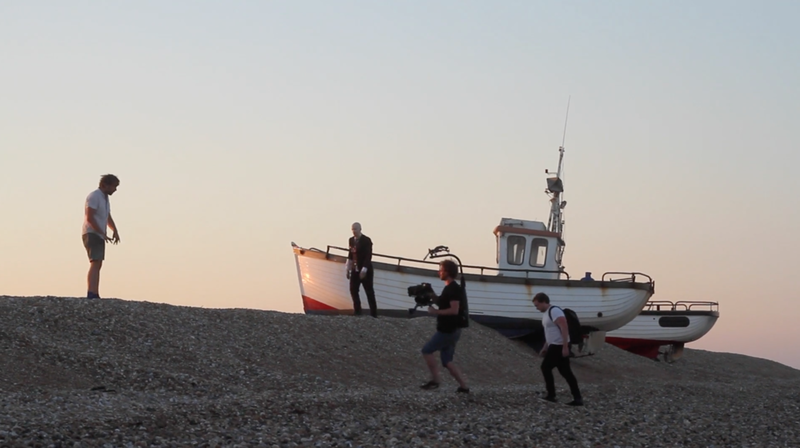 Other Brother Studios spent some time with James, initially choosing a location in Dungeness, well known for its post-apocalyptic appearance. It's quite an eery environment, with a large nuclear power station, old deserted fisherman huts and abandoned ships. After choosing the location, Other Brother Studios went to work finding the crew; it was a tough ask for someone to transform Reuben into a robot and we asked the incredible Natasha Lawes to get involved. Natasha is a creative designer, make-up and hair artist, tech-FX costume & mask maker and special-FX & model maker. She's basically one seriously talented individual capable of putting her hand to anything, no matter the task at hand! Natasha initially did a head cast and arm cast of Reuben (after he shaved his hair and beard off - committed to the cause), and then created a number of moulds and subsequent realistic models and robotic details which we used in the shoot. In terms of rigs, Other Brother Studios did a few tests with the Sony FS7 attached to the Shape shoulder rig. We needed a Directors monitor for James so we used the Odyssey 7Q+ (a firm favourite at Other Brother Studios), which sat atop the camera via a magic arm connected to a Shape top plate. This gave us a freeness to the shooting style but James wanted a bit more control so we ended up using a Vario 5 Easy Rig from Feral Equipment hire, which allowed quasi handheld / steadicam feel to the shot. Lenses wise Other Brother Studios used the excellent Cooke S4i lens set from Feral Equipment hire (14mm / 21mm / 28mm / 35mm / 50mm / 85mm), which were simply superb. As the Sony FS7 has a super 35mm sensor there is a crop to the image, as it's not full frame, so we had to bare that in mind. At times we would have liked to go even wider, but in hindsight that was probably down to James and I having watched and loved the Revenant prior to this shoot! The lenses are really fast, meaning that we had to stop down with the inbuilt ND filters most of the time at 1/64. At times, mainly at midday when the sun was really high, it would have helped to have a matte box with additional ND filters - a couple of times we had to keep the aperture at f/4. Although mostly these were landscape wide shots, so mostly suited to what we were shooting. The shoot day itself was a long one. A 04:00 start for Other Brother Studios in Brixton then travel to Woolwich for 05:00 where Reuben had most of his make-up applied. We arrived at Dungeness at 06:00 and set-up our gazebo and Natasha Lawes and Ruth Pease finished the make-up. We started shooting at around 20:00 and finished around 21:00. All in Other Brother Studios got back at midnight, so a nice 20 hour day.